You’re probably all desperately scratching your heads for Diwali presents. 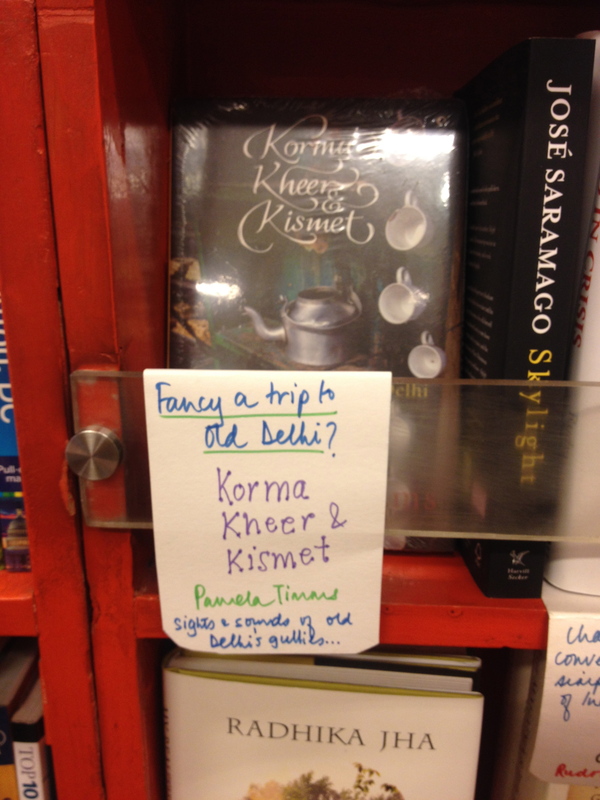 Look no further….here are all the many ways you can buy Korma, Kheer and Kismet – no matter where you are! In India, the hardback version is available in all good bookshops (or should be!). 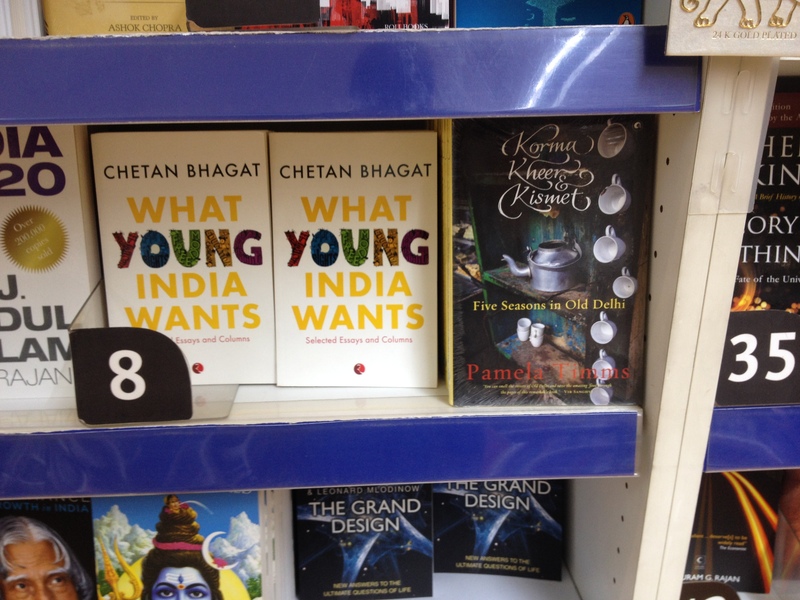 In India, you can also order the hardback via Amazon India and Flipkart. So finally Korma, Kheer and Kismet – the product of years of joy (in Old Delhi) and heartbreak (at my desk) – is here. Although I still can’t quite believe it and do a double take every time I see it in a shop – my little book out there trying to make its way in the world. The response to the book so far has been incredibly cheering, particularly in Old Delhi itself. As soon as I got back from my holiday in Scotland I went straight there to give copies to the vendors who feature in it. First stop was Bade Mian’s shop in Lal Kuan. The Siddique family’s kheer shop is a stone’s throw from the Chawri Bazaar metro and I always start any Old Delhi jaunt there – sitting at one of the tables at the back with a cup of chai and a tiny square metal plate of kheer. Jamaluddin is a wonderful character who is always ready with a colourful story – many of which I can’t understand because he seems to speak in Urdu rhyming couplets. While I wait for my editor to put her red pen through the manuscript for Korma, Kheer and Kismet, I’ve finally found time to test the book’s recipes. 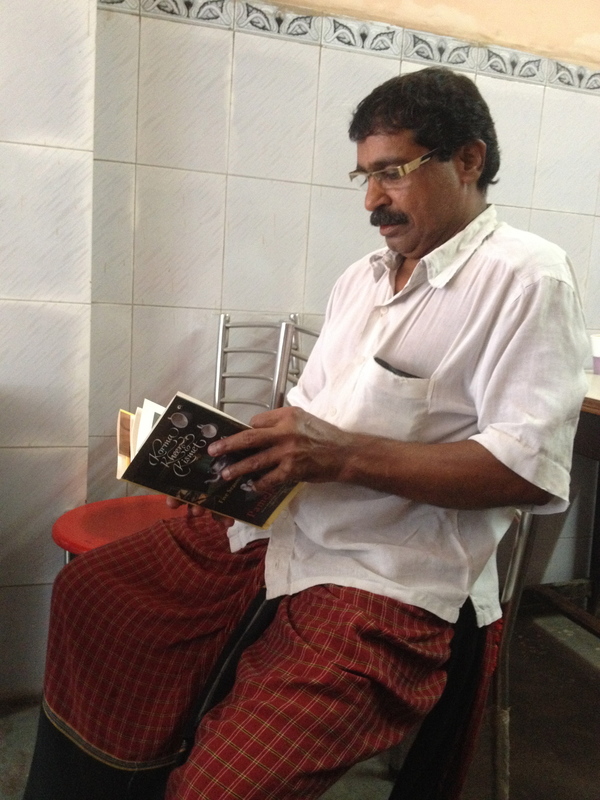 Even though it isn’t a cook book – more of an Old Delhi street food memoir – each chapter contains one or two recipes. Some of them were given to me by street food vendors, others are my own versions based on watching the cooks at work. First to be tested was one of north India’s favourite comfort foods: Chana Bhatura, specifically the version made by Sita Ram Diwan Chand. They have been making their magnificent dish in Paharganj since their ancestors arrived in the area after Partition and I once was lucky enough to spend the morning with the shop’s owner Pran Kohli. He patiently showed how they make all the various elements, the chickpeas, bhatura, pickled carrot and tamarind chutney. I blogged about it in 2009 and it has been the most popular post on Eat and Dust ever since but somehow I never got round to making it myself. 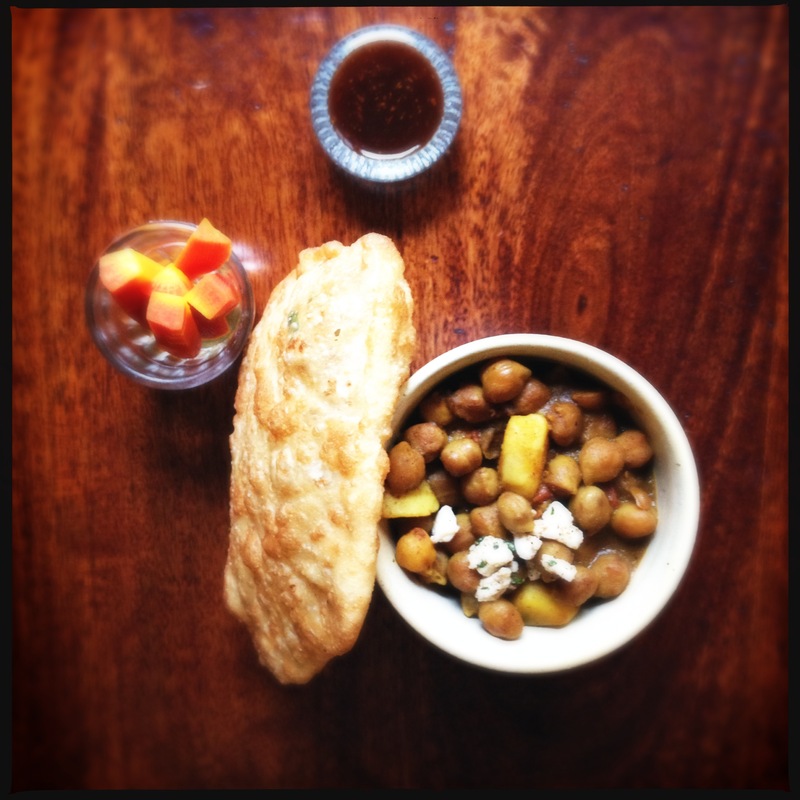 (although I do frequently make my friend Anita Dhanda’s extremely easy and delicious recipe for Chana Bhatura). I was right to feel daunted by their incredibly detailed recipes and can finally testify that Sita Ram’s recipe is not for the fainthearted cook – it took me about a day and a half to complete – but it turned out to be well worth the effort. As well as being very time-consuming, the recipe is also very nuanced – from the careful spicing of the chick peas and potatoes to the subtle accompaniments like the pickled carrots, paneer-stuffed bhatura, and tamarind sauce, every element of the dish has a vital role to play in producing an astounding range of flavours and textures. We’ve been happily gorging on it for days. So here it is, a (rather lengthy) sneak peek of one of the recipes that will appear in Korma, Kheer and Kismet. It’s been thoroughly tested and somewhat amended from my original scribbled notes from Pran Kohli of Sita Ram Diwan Chand. Of course it’s not as good as his – after all they’ve been practising since 1947 – but it’s still an outstanding dish to make at home. Soak the chickpeas overnight in cold water. In the morning, drain then put the chickpeas in a large pan with the ginger, cassia leaf, bicarbonate of soda and about 2 ½ litres of cold water. Boil the chickpeas until they are tender but not mushy – about 30 minutes. Meanwhile, in a separate pan, melt a tablespoon of oil or ghee and brown the onion. Add the yogurt, chopped tomatoes and turmeric. Stir well and cook on a low heat until the mixture is a deep reddish brown then remove from the heat. When the chickpeas are ready (retain the cooking liquid which will be much reduced) add the onion/tomato mixture and stir well. Add salt, pepper, anardana, garam masala and red chilli powder and stir well. Continue cooking until the gravy has thickened then take off the heat. To make the spiced potatoes, peel the boiled potatoes and chop into 2cm cubes. Heat a tablespoon oil in a pan, add the chopped onion and tomato cook until browned. Add the turmeric, salt, black pepper, red chilli powder, anardana powder and garam masala. Cook for a few minutes until the spices are roasted. Add the potato cubes then stir well to coat them in the spiced mixture. Stir the potato cubes into the chickpea mixture. Mix together the flour, semolina, salt, yogurt and 150 mls of water. Knead well until you have a soft, springy dough. As the flour and semolina absorb the water, you may need to add more water. After about 5 minutes of kneading you should have a smooth ball of dough. Put the dough in a clean bowl, cover and leave for 4-5 hours. To make the bhatura stuffing, combine all the ingredients and mix well. Work a tablespoon of oil into the rested bhatura dough then divide it into 12 pieces. Roll each piece into a ball between your palms. With your thumb press a large dent in each ball, put a dessertspoonful of the stuffing into the dent then close the dough back up over to cover the stuffing. The stuffing should be completely enclosed. Roll each stuffed ball out as thinly as possible. Heat about 6 cm oil in a kadhai. When a small piece of dough dropped into the oil rises quickly to the surface, the oil is the right temperature to fry the bhature. Gently slide in one bhatura, let it cook for a couple of seconds then press it down with a slotted spoon – this helps it to puff up. Flip the bhatura over and press down again. When the bhatura is golden brown and puffed up, removed to drain on some kitchen roll. The pickled carrot needs to be started a few days before you want to serve the chana bhatura. Peel and cut the carrot into small batons about ½ cm thick and 6cm long and place them in a clean jam jar. Mix together the mustard seed, salt, turmeric, lime juice and water. Pour over the carrot sticks, close the jar and leave the carrots to steep for at least 2 days. Drain off the pickling liquid, rinse the carrots then mix with ½ teaspoon salt, ¼ teaspoon red chilli and mix well. The carrots are now ready to serve. Mix together all the ingredients in a small pan, bring to the boil then let it bubble for a few minutes until slightly thickened. Serve with the chickpeas along with slices of raw onion, pickled carrot, and tamarind chutney.